Christmas Baking - Saving the world from bad baking. This course is a mix of demonstration, hands-on baking and afternoon tea for people with same basic knowledge in baking. 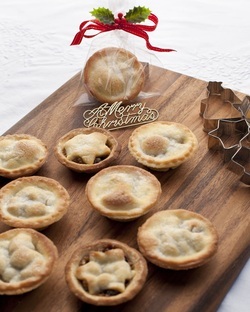 Learn how to prepare a tender sweet shortcrust pastry, baked until golden and crumbly with a home made fruit mince filling to enjoy the best mini fruit mince pies ever. Make some chocolates as gifts for family, colleagues, neighbours and friends. Enjoy a wonderful traditional pavlova, perfectly crisp on the outside while chewy and soft on the inside, served with cream and fruit. Sit down after baking for some relaxed afternoon tea, enjoy your delicious treats and take home your leftovers. Mosman High School, $150, click here to enrol.